I’ll choose Safety for $100, please?! There’s something about myself that I haven’t ever told you guys. I. am. super. paranoid. and. neurotic. about. random. things. that. probably. really. aren’t. that. big. a. deal. Or, before I fly anywhere, I worry myself sick that I might die in a plane crash. I’m not so worried about me dying, just the fact that my kids wouldn’t have a mom anymore. When we are on the freeway, I freak out when people brake in front of us and I don’t think Ben is braking fast enough. WHAT IF WE GET INTO A HORRIBLE ACCIDENT? When Ben is out of town, I make the kids sleep in my room. What if the house catches on fire in the night and I can’t get to them? One of the many neurotic tendencies I have is to worry the children will get hurt, or worse, will do something that will cause death. Having a 2 story house has only exasperated this paranoia of mine. I worry they will fall over the half-wall into the foyer. And I especially worry about windows. Or, more specifically, that they will open a window on the 2nd floor, and will then proceed to fall out of said window. And will die. Most of my worries end in someone dying. Very glass-half-empty would you say? 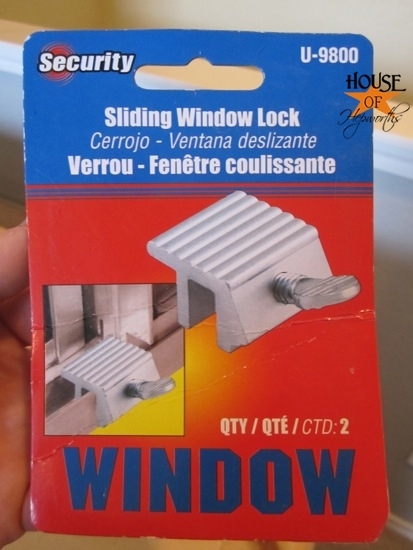 Anyway, for a few bucks I found the most awesome window locks. Ever. I got them at the hardware store but I’m pretty sure I’ve seen them at Walmart as well. Basically, you put it where you want it, then you just turn the little knob until its secure. I’m extra paranoid that the kids will try to take it off, so I turned the knob with a pair of pliers. These suckers are not going anywhere. I installed it high enough that they can still have a little breeze action if they’d like, but low enough that their noggins can’t fit through the window opening. When you open the window, it hits the lock so it can’t go any higher. Best. Idea. Ever. Well, considering we don’t even have any fire ladders anyway, I guess their options could be a) die in a fire, or b) die from jumping out a 2nd story window. If the kids really REALLY need to get out of a window upstairs, they can climb out of the office window. It has a roof below it. So anyway, for a few bucks I’ve given myself immense peace of mind knowing the kids can’t kill themselves falling from a window. « That’s it. I’m moving out. Oh my! I thought I was the ONLY one that thought that way….my hubby says I’m a FREAK and how in the world do I come up with these things….hehehehe So glad to know I’m NOT alone! 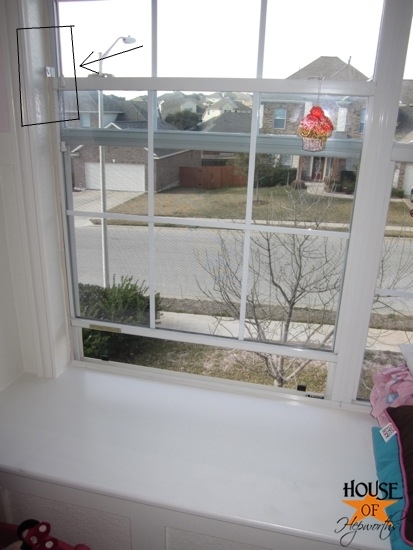 Our last house had a second story and my greatest fear was my son falling out of it….we got Vivent….it alerts us to whenever a door or window is open:-) Ahhhh piece of mind! I think this explains why you never let me drive when we go places together. It all makes sense now. 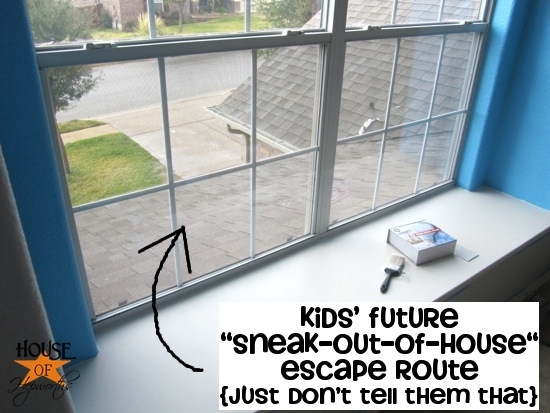 🙂 This is a great idea…our boys have a second story window in their room, and I caught the older one trying to get out on the roof to get a toy that he’d thrown up there. FREAKED.ME.OUT. Thanks for the smart idea. 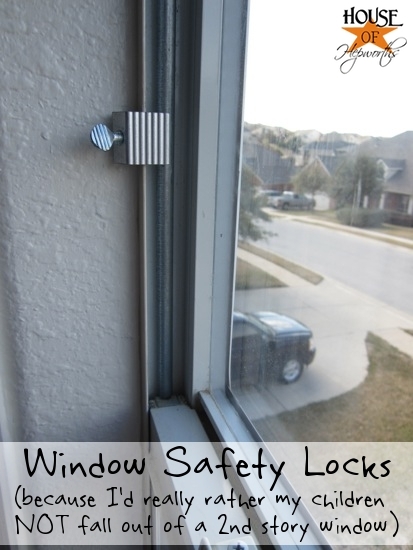 They work great on sliding glass doors too. Had to install them when we got a pool and my youngest was little. I am like you when it comes down to airplanes. DON’T LIME THEM! I am the same way! I hate airplanes, I worry everytime I get in the car, and my hubby too thinks I’m a freak about safety. You can never be too cautious! I’m glad I’m not the only one out there! Oh I’m the same way and it gets annoying at times. It doesn’t stop me from doing things but rather I can freak out in my mind right before I do something scary. When I get on planes it’s the worst. I am so glad I am not the only one that does this! I thought I was crazy! I don’t live in a 2-story house, but I am afraid someone will break in his window and take him during the middle of the night. Scary stuff. And I let him sleep in my room when my hubby is gone too. Long story short, it’s definitely worth it to invest in window locks! I think you and I could be kindred spirits. My husband often calls me the Safety Nazi. I don’t care though. My kids are more important to me than anything else and I am not willing to risk their safety. It only take a second. We had a neighbor who’s little one fell from the second story window…simply a miracle she is still here today. You do what you need to do girl! I’m glad I’m not the only one. On Saturday we went to the SF Giants Fan Fest. I was sitting down in the stands thinking that if there was an earthquake right now….. These would be nice if you wanted to sleep with a window open on the first floor too so no one could climb in the window! Smart!!! I also fear the worst in most situations. I need to look into these for my kids’ windows. Thanks! I always worry about the . . . What if there is a fire? 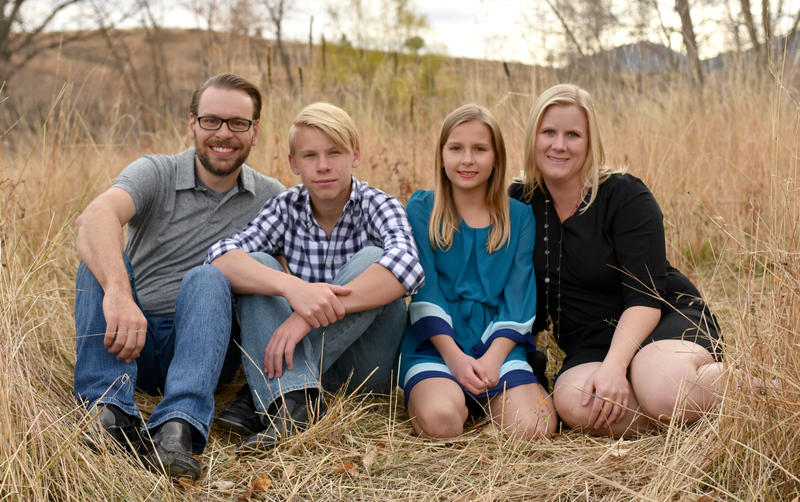 Will my kids be able to escape? Will the firemen be able to get to my kids in a timely manner if I have locks on my windows?! But I also have boys who open windows and toss crap out of them and I had a cousin who ran into a window screen than fell right out and he and the screen dropped 2 stories. It’s really not weird or unusual to worry or be paranoid. It’s all the people who don’t worry and arn’t paranoid that I worry about. You know? I still tell my kids to buckle up. Even the soon to be 30 year old! You aren’t crazy, and I really appreciate you sharing these window safety tips. I have friends who lost their little boy last year when he fell out a second story window. It happens. Thank you for sharing this product with others. We currently live in a one story house, but believe me, if we move, I will be getting those clips! Ha- I thought I was the only one!! Thanks for sharing your thoughts. I tried those window clips a few months back but they did not fit well on whatever type of windows I have. Instead we ended up cutting a piece of wood that fits just snugly enough to stop the window from opening but not so tight that it couldn’t be opened in an emergency like a fire. The wood is painted the color of the trim and isn’t noticeable at all. On the lower floors it gives me an added feeling of security too. Keep taking care of your kids and don’t worry about feeling neurotic! You are surely doing a great job! Oh, my! I thought I was one of the very few neurotic mothers out there. I felt like you were writing my thoughts verbatim when I read your post! I am so fearful of my children getting hurt that literally everything gets analyzed in my mind, and it usually involves a death scenario. Husband: We are getting the kids bikes for Christmas. Me: But what if they fall? What if a car hits them? Maybe we should buy helmets along with elbow and knee pads, and gloves so they won’t scratch their hands when they fall. It goes much further than that for the bikes, second story bedrooms, burglars, fires in the middle of the night, bullies, choking on food if I”m not right there watching them eat, pools, living by rivers or lakes, eating genetically modified foods, but I’ll spare you. Thanks for posting these window locks. We live in a two story house and I’m always worried about the kids falling out the window. I looked for them when we first moved 3 years ago and couldn’t find them guess I need to look when I go out this weekend. Eric Claptons little boy died whilst falling out of a window that did not have the proper window safety guards required in NYC. Saddest song ever written. 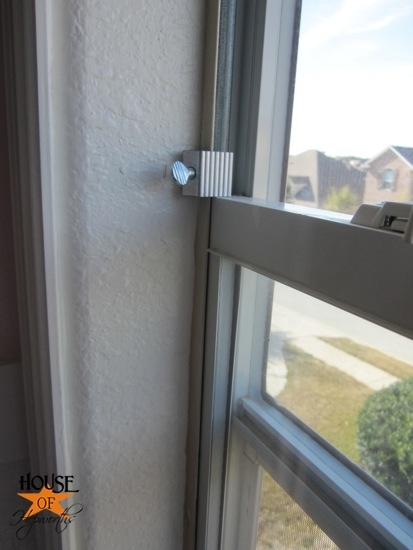 These little clips ALSO come in handy if you have one of those annoying windows that SLIDES DOWN when you open the window! And to brace an old fashioned slide in adjustable window screen for windows that don’t have fitted screens–or the ones where they DID have fitted screens but SOMEONES KID decided to use the window as an ESCAPE HATCH and actually placed a picnic table (end table size) in the foliage under said window and used it to CLIMB OUT OF. And in of course. And of course he BROKE the fitted screen frame in the process. No screen for HIM! How OLD was this kid you ask? Musta been oh dating age right? Nope. Was about—9. First floor window too. Right next to MY bedroom window. And yeah—Your kids have ALREADY figured out that there is a roof just waiting for them to climb out on. But–they rarely get hurt doing what YOU worry about. We have had–stitches from running toddler head thru barb wire fence sledding BECAUSE the kid changed the sled course to make–kid you not—moguls. A different kid got stitches and a trip to the OR to have his ARTERY repaired after he chased a pool ball that fell and he slammed into the pool table. The Middle Child–a girl this time!–fell on a rock wall and tried to tell me that she was badly hurt. I looked and her hand seemed FINE. Go put a bandaid on it I said. She turned to go and the palm flexed and suddenly I was looking at the model of “Bones of the Hand” from my Phys Anthro days. Um–CAR TIME KIDS! The GRANDKIDS have carried on the “Tradition”–the little girl was chasing a BOY at an indoor padded playground; ran into a PADDED piece of play equipment and broke ALL of the bones in her foot. She was—-2. Did I mention I have a horrid fear of flying? And–ice? And I FELL on ice—and got really really hurt? No ones kids have EVER gotten hurt walking around with a lollypop stick tho. In case you were wondering. Thank you! Thank you. This will become so helpful. My 7 year old son has autism and this will give me piece of mind that he wont sneak out the window. These locks are fantastic. I love them!